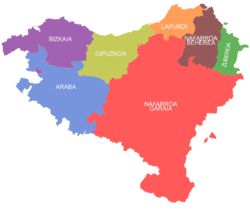 The seiven provinces o the Basque Kintra, as claimit bi certain Basque sectors. 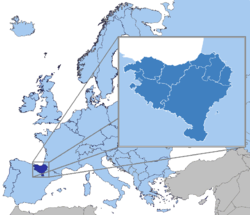 The Basque Kintra (Basque: Euskal Herria) is a European cultural region hame tae the Basques in the wastren Pyrenees that spans the border atween Fraunce an Spain on the Atlantic coast. It comprises the Autonomous Commonties o the Basque Kintra (autonomous community) an Navarre in Spain an the Northren Basque Kintra in Fraunce. Even tho they ar no necessarily synonyms, the concept o a single culturally Basque aurie spannin various regions an kintras haes been closely associatit since its vera inception tae the politics o Basque naitionalism. As such, the region is considered hame tae the Basques (Basque: Euskaldunak), their leid (Basque: Euskara), cultur an tradeetions. Nivertheless the aurie is neither linguistically nor culturally homogeneous, an the vera Basqueness o pairts o it, such as soothren Navarre, remains a vera contentious issue. ↑ The Basque Kintra daes nae hae a de jure caipital, as it is nae a sovereign kintra. The caipital o the Basque Autonomous Commonity, is Vitoria-Gasteiz. This page wis last eeditit on 22 October 2016, at 19:34.